Happy Valentine's Day! This morning the Kitchen Genius and I renewed our wedding vows along with all the other married couples at our church. There is something so thrilling about looking your husband in the eye and still meaning those words after nearly 20 years together. It gave me goosebumps. In keeping with our morning activity, I baked a recipe from our newly published church cookbook, "Cooking With Spirit." The recipe was from Bertha Fuqua, a wonderful lady who has sadly passed on. This coffee cake is incredibly moist and flavorful and feeds a crowd. The recipe called for a 13 by 9 pan and at first I thought there wasn't enough batter. I was wrong. It rose up nicely in the oven. Even our older chicken, Jasmine joined in and laid the pretty green egg on top. She hasn't laid anything since late September. Rosie has been quite productive all winter and today she laid two eggs in one day! We know this because she is our only chicken who lays white eggs. Here's to love, the coming of spring and a bounty of eggs! Preheat oven to 350 degrees. Grease and flour a 9 X 13 inch baking pan and set aside. Beat butter on medium speed until creamy; gradually add sugar and 1/2 cup brown sugar, beating well. Add eggs. Combine 2 cups flour, 1 teaspoon cinnamon, baking powder, baking soda and salt. Add to butter mixture alternately with buttermilk. Beat well. Spoon half the batter into pan. 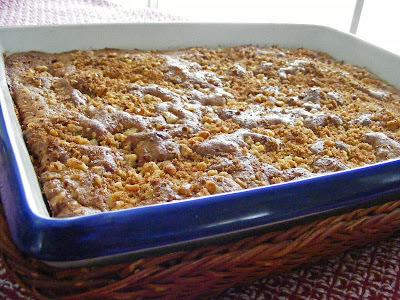 Combine the remaining 1/2 cup brown sugar, remaining 1/2 teaspoon of cinnamon and chopped walnuts. Sprinkle half of brown sugar mixture over batter. Top with cranberries. Top with remaining batter and remaining brown sugar mixture. Bake at 350 degrees for 35 minutes or until a toothpick inserted in the center comes out clean. I love the look of this cake - it just seems like it will taste buttery and caramel-y too. must get more cranberries and stock up in freezer before season is gone. Congrats on renewing you vows. That is very sweet and so is the coffee cake!!! OMG it's all wonderful, the vows, the cake, the beautiful eggs! 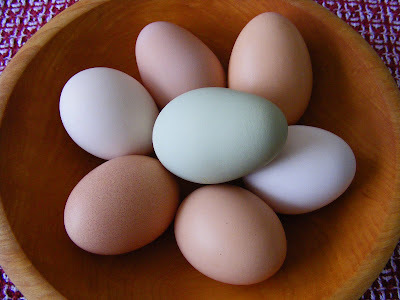 How gorgeous those eggs are--no need for egg dye for Easter! 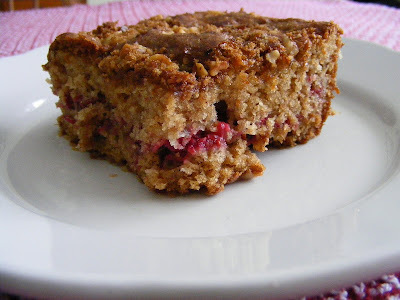 ;-) The coffee cake looks delicious--love the cranberries. How fun to renew your vows. That's so sweet. I love this coffee cake! It would be a big hit in my cranberry, cake lovin' family! So beautiful to renew your vows! Our anniversary was Sunday, 18 years! It's been a wild ride and we have so much to laugh about and be thankful for. Your coffee cake is a must, I can't wait to wake up and make this coffee cake! Renewing your vows with the church is such a lovely way to celebrate Valentine's Day! And the cake looks good.